Winding down the twisting roads through the highlands of the Kangra valley, the sight that greets you about an hour before Kangra town is breathtaking. Up north, the gentle swell of the rolling uplands suddenly come up smack against an incredibly high jagged wall that dominates the horizon. The wall it seems, goes on forever, running in a long unbroken stretch from the east to the west, like a mythical barrier guarding some forbidden paradise. 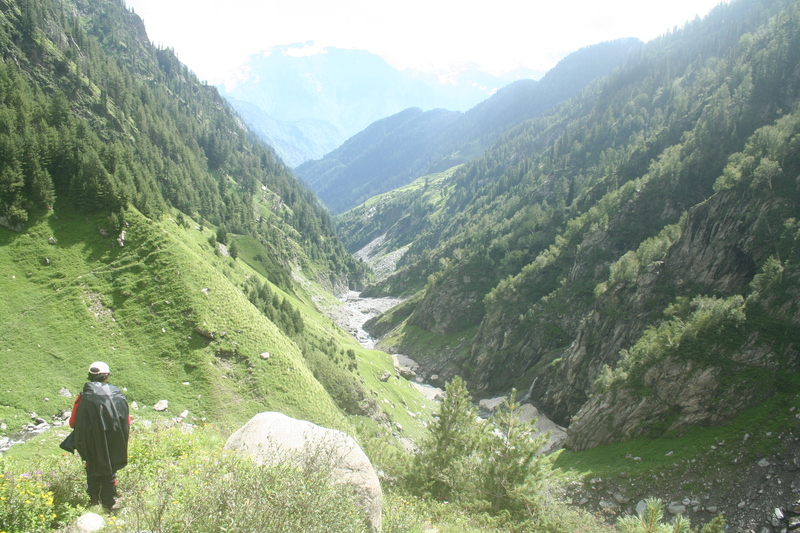 At an average height of 14,000 feet, the Dhauladhar range isn’t as large as the other Himalayan sub-ranges of Himachal Pradesh, but it is certainly one of the most dramatic. Rising 12,000 feet from valley floor to ridge-top, this serrated range looms over the landscape, clad in a thick coat of snow and ice that only relents in the rainy months. 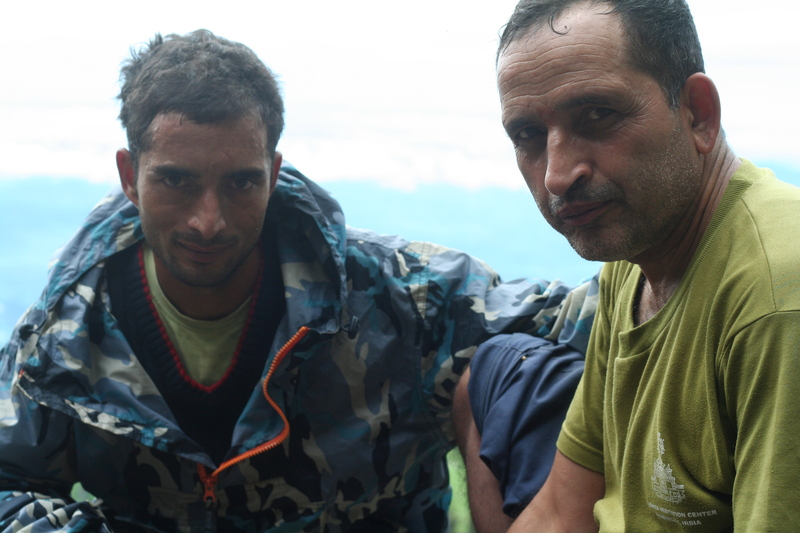 Monsoon is hardly the best time to go for this trek, and with the abnormally heavy rains this year, we were told roundly by all comers that it was madness. However, two things were in our favour. One, our guides were of local Gaddi stock, the dominant community of much of the Chamba and Kangra region. Mostly traditional shepherds, they know every valley and pass around the Dhauladhar and Mani Mahesh ranges, which form their old homeland of Gadderan. The second was that one of my companions, Amrita, was a trained mountaineer who had participated in several big expeditions. Brought together, these two factors played a big part in assuaging any fears I might have had. 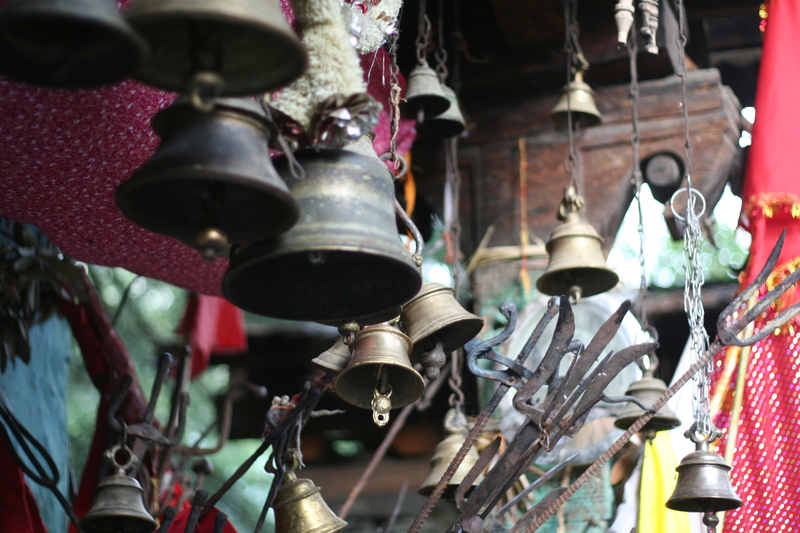 As we limbered into McLeodganj one Monday morning, the signs were not encouraging. 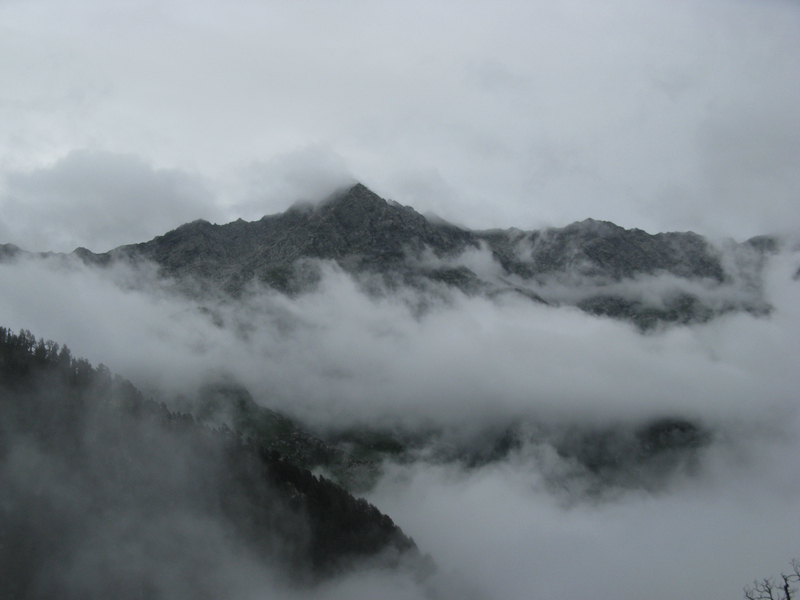 The Dhauladhar was cloaked in thick clouds and it was raining hard. In a way, it was better this way. Once you’re soaked through, you pretty soon get used to the idea. The first thing to do was to meet Jagdish and Gulab, our companions for the next 10 days. Jagdish, a stocky, solid man with a shy and retiring nature had been guiding in the area since 1979. His compatriot Gulab was a wiry 26-year-old father of two with ankles of steel, an irresistible charmer and an ardent believer in the powers of direttissimo-the most direct route over any obstacle. 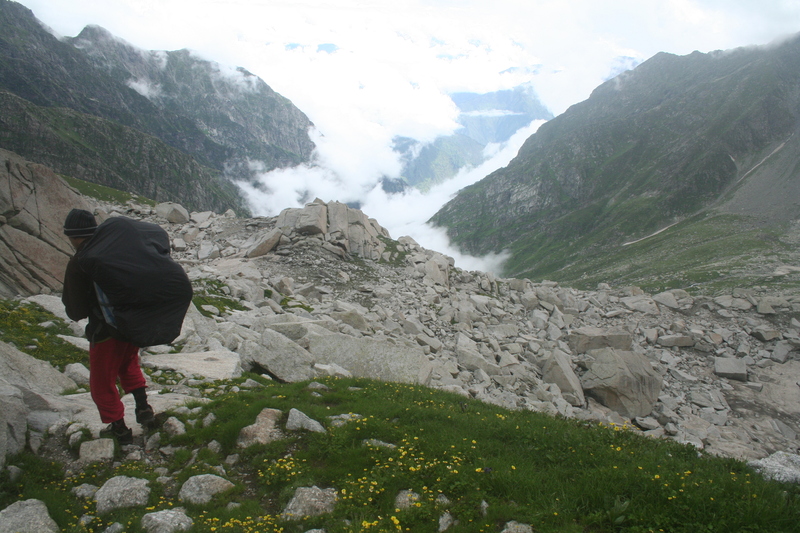 Although we had planned to stay an entire day at McLeodganj and re-pack our sacks and shop for fresh vegetables and other foodstuffs, Jagdish was of the opinion that we shouldn’t waste any time in the prevailing weather and make directly for Triund, some 10 km and 3,000 feet above us. We scattered in different directions for one last burst of provision shopping. A hearty breakfast, numerous cups of tea and some ruthless repacking later-in which we discarded most of our surplus clothes and trekking luxuries-we were off climbing steep country tracks through the resinscented pine forest of Dharamkot. By the time we reached Triund a few hours later, the unique agony of carrying a 12 kg rucksack on my back was beginning to tell. We huffed and puffed our way over the final rise and collapsed, dripping with sweat and rain, at one of the four tea-shops that are a fixture here. We quickly took over an old colonial-era forest hut and made copious cups of tea and struggled to get our things dry. It was raining as hard as ever, and there wasn’t much else to do but cook a quick dinner and fall asleep hoping fervently for a clear dawn. This was not to be. We woke up to what has to be the most dispiriting sight while on a trek-thick clouds and driving rain. So much for our hopes to get an early start to Lahesh cave higher up the range. If it kept raining like this we wouldn’t even be able to start later during the day, as the ferocious nalas higher up would be in full spate, making any crossing a treacherous business. With not much to do, we decided to concentrate on acclimatising our bodies to the high altitude of Triund, following the mantra of eat, drink, sleep, move. To ensure that the brain adjusts itself quickly to the rigours of rarefied air, it is essential to drink lots of water, take short naps, and climb to a height higher than that of the camp before returning to it for hot food. The rain had subsided for a bit, and so after a quick shut-eye, we started out climbing halfway up to Lahesh. Amrita, a rock climbing teacher, took me and KP, my other companion, up rock faces of varying difficulty, giving us tips on how to make the best use of even a tiny finger-hold. By the time we returned to the hut a few hours later, exhausted and exhilarated, the Dhauladhar revealed itself after being lost in clouds for two whole days. High up into the sky climbed the rocky pinnacle of Mon peak and I could just about see the Indrahar Pass as a tiny notch high up on the forbidding ridge. We went to sleep that night fervently praying for a cloudless morning. And so it proved! The sky was as overcast as ever, but for a change it wasn’t raining and we could see far up the main range. A quick breakfast and we were soon making our steady progress up the ridge, keeping our fingers crossed for good weather. After a couple of hours we reached the treeline at the grazing ground of Laka Got. We were roughly half-way up to the cave, and from here, the trail led over steep boulders. The mist was closing in again and we figured that we had barely an hour of dry weather. So, resting long enough to have a cup of tea, we went on through intricate boulder mazes occasionally lit up by bright splashes of alpine flowers. The rain started, moving from a light drizzle to a downpour, but we had no choice but to keep moving. After jumping over a torrential nala, and climbing over ever-steep and now slippery boulders, we finally crawled into Lahesh, a large, low natural cave formed by two massive overhanging boulders. It was only early afternoon and soon after we finished lunch, our elusive friend the sun finally shone through. It was a pleasure to go through our acclimatisation routine in bright sunshine, surrounded by massive, sombre boulders. Hanging over our heads, like a petrified wave almost a thousand feet above, lay the massive Mon peak and the tiny Indrahar pass. The next day was crucial, as we would be constantly exposed to wind and rain and possible rock falls the entire length of the day’s trek, till we reached the camping ground of Chhata Parao on the other side of the pass. Although misty, there was no rain, so thanking our lucky stars we set off in semi-darkness at 6 am. The enterprising Gaddi shepherds have since time immemorial built and maintained a vertical stairway of boulders up to the pass. Although it took every bit of our strength and stamina, we were finally upon the Indrahar pass (4350 m) five hours later, just as the sun was breaking through the clouds to shine upon the Triund ridge, now far below us. The jagged Dhauladhar ridge marched off into the clouds on either side and below us was our steep descent skirting rotting glaciers into the Ravi river valley, a two day long march away. My exhilaration knew no bounds as I gazed upon the distant panorama of the soaring Pir Panjal range, extending all the way to the west, right into Kashmir. However, you don’t stop for too long at a place this exposed in inclement weather, and our long knee-shattering descent into the Kuarsi valley began. At first over steep rocks, and then hopping over boulders, we descended towards a patch of green some 3,000 feet below us in the valley. Around us were the rocky peaks of the Dhauladhar with quaint titles like Arthur’s Seat, Two-Gun and the Coolins, named by old British armymen who first climbed them. Soon we were jumping over ever widening side-streams coming down to join the main Kuarsi nala. The weather, which had behaved itself up till now, proceeded to unravel. A thick mist soon surrounded us and loud thunder reverberated around the cirque of rocky peaks that we’d just left, while we floundered our way through waisthigh weeds and stinging nettles. Flogging our path with an ice axe we reached camp late in the day. The next morning was gloriously fine, and we immediately took the opportunity to try and dry our things. We still had to leave quickly since the main Kuarsi nala had to be crossed before it swelled with ice-melts from the glaciers upstream. When we reached it, the river was thundering down, and the main channel was too deep and swift for us to wade through. So Gulab and Jagdish cut up two fallen pine tree trunks and lashed them together as a temporary bridge. We edged carefully across the swiftly moving water, conscious that the slightest misstep would create a very difficult situation for the whole group. It was veritable heart-inmouth stuff. Next came landslide zones-mushy vertical slopes which continued to slide slowly down the mountain as we walked as fast as possible across them, plunging our feet deep into the gooey earth to find stable purchase. Thankfully, this too passed without mishap, and soon we were having a hearty lunch by a beautiful brook amidst pine groves and rolling meadows. We were reminded of the land’s wildness when we came across the carcass of a cow stripped clean by a bear. It was the final lap before reaching the village of Kuarsi an old hometown of the Gaddis who first came here in the 12th and 13th centuries. We camped for the night in the wooden temple of Indru Naga which dominates the village. My only grouch had been that the peak of the Mani Mahesh Kailash had been hidden from us by the monsoon clouds. One of Shiva’s five abodes in the Himalayas-the holiest of which is Mt Kailash in Tibet-it is a beautiful peak of stern majesty. Imagine my glee then, as I peered out from the temple window the next morning and saw the Kailash standing tall, its pinnacle seemingly floating over the boiling clouds as a spectral sun shone through the vapours. It had been a hard trek, with many knocks and quite a few scares. But, bathed in that early morning glow, it seemed like we were living in a state of grace, surrounded by these incredible people and their old culture. hi came across ur post its realy incredible..congratulations fr tht.. my name is neeraj n im from bharmaur..i wrk in delhi n im planning to go home this june by this route..can u pls be more accurate about the distance of one place to another..
Intrepid stuff Bibek, you’re a bolder man than me. And fiercely written. I think my knees are aching. Hey times, thanks. Coming up soon. nice, beq. more on the gaddis and kuarsi please.